A wooden honour roll commemorates those from the school who served in World War One. An honor roll, containing 80 names of Rosehill boys who had answered the call, was unveiled at the Rosehill public school on Thursday afternoon in the presence of the children assembled in the playground and a goodly number of the residents. It was explained by Mr. P. J. Bennett the head teacher, that Rosehill being just between Parramatta and Granville, the names on the board were either on the Parramatta or Granville roll of honor, but it was thought by many people that Rosehill should have its own roll of honor, and the Parents and Citizens' Association had met and decided to have one. This was largely at the instigation of Mrs. Staff. 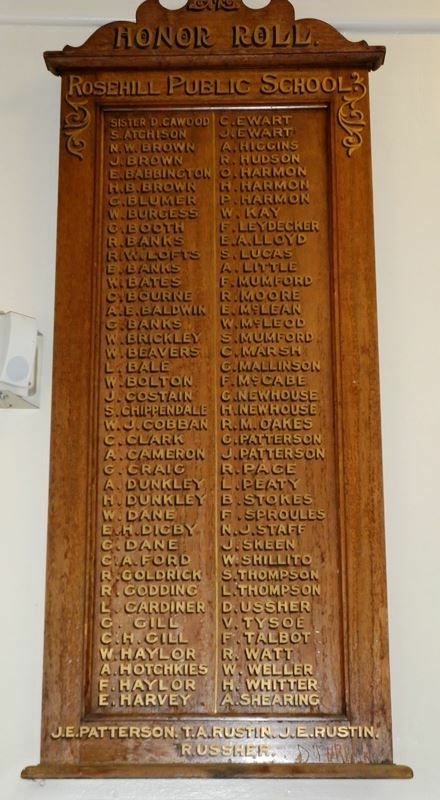 Mr. Staff made the board and Mr. Wilson polished it free of charge, and the parents and friends of the children of the school, as well as old pupils, contributed of their means towards paying the expense of the lettering on the board. There were names on it of boys who had gone from the school ranging up to 15 years ago.